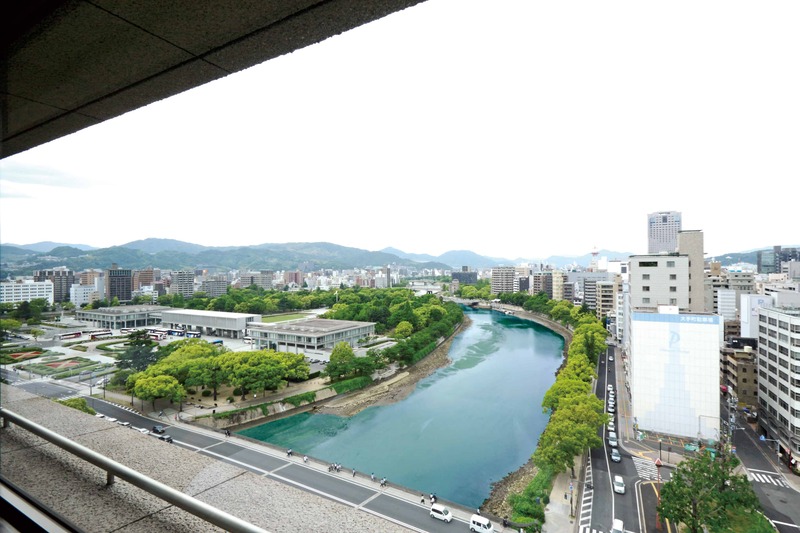 On the top floor of the Sunroute Hotel on Peace Boulevard, Kissui [吉水] serves excellent, beautifully presented kaiseki cuisine in a smart, but relaxed setting with a fantastic view over Peace Memorial Park and the Ota-gawa River. Kissui has an excellent local reputation for serving gorgeous seasonal kaiseki multi-course meals. The great view makes it a very popular lunch spot – if you plan to go for lunch, try to reserve a window seat in advance as it would be a real shame to miss out on this part of the Kissui experience. 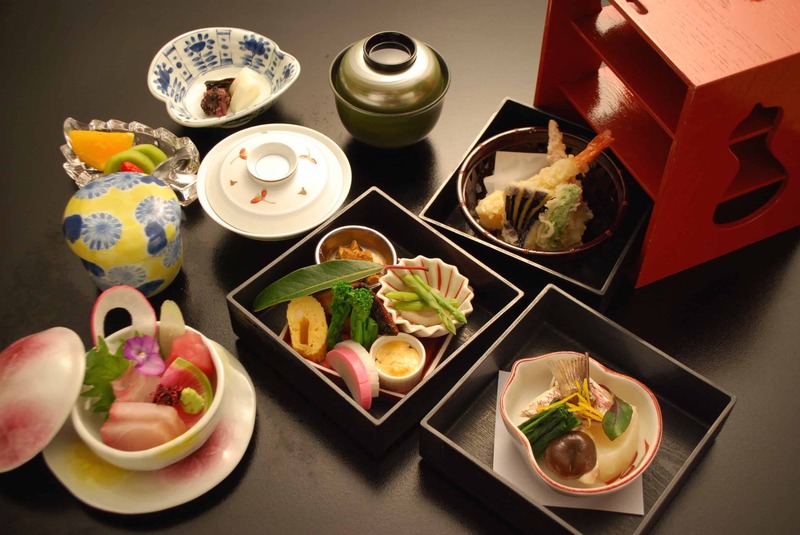 The food is very traditional with particular attention given to presentation and even the garnishes on the many dishes that are brought out one after another by wait staff dressed in kimono are carefully selected and arranged like miniature (and edible) works of art. The interior is modern with traditional touches such as sliding doors. Seating, however, is western style, at tables and chairs which allows diners not accustomed to zashiki-style seating on the floor to focus on the culinary experience rather than aching knees. 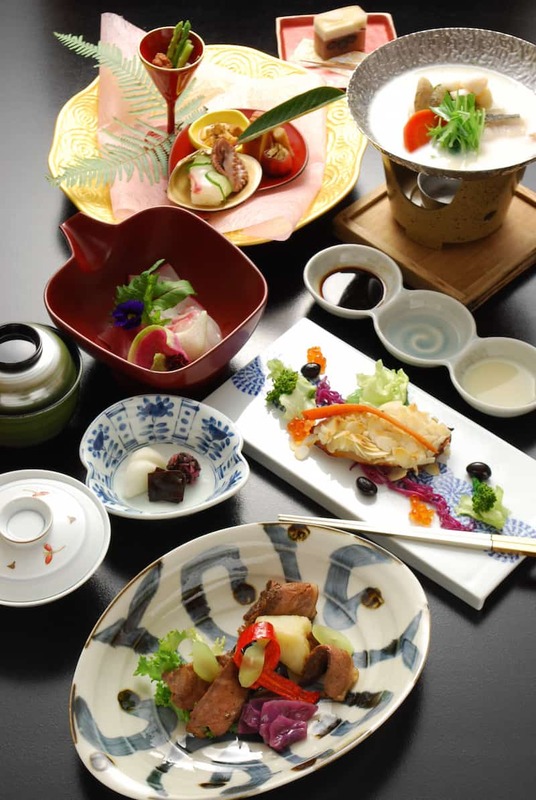 Enjoying a kaiseki meal is a quintessential Japanese experience, and one that everyone should try at least once while in Japan. It can also be quite bewildering and sometimes intimidating. Kissui is quite relaxed in this respect, making it perfect for the uninitiated. The high degree of skill needed in putting what may sometimes appear to quite simple dishes together with choice ingredients means that kaiseki tends to be higher priced that your average meal. If you want to give kaiseki a try without pushing the boat too much, I recommend trying the Kissui Gozen lunch course, pictured below. This course, only available on weekdays, consists of around 8 dishes which all come out at once on a lovely presentation tray and is a real bargain at only ¥2800. For the more adventurous and those looking for a more authentic experience, however, I recommend trying one of the more elaborate courses on offer which are listed below. Take a look at (most of) the meal we were served in December here. The choice seats are those next to the window with the views, however, there are also nice private rooms which can accommodate small and large groups and which have horigtatsu seating so you can get that Japanese feeling but be able to stretch your legs. There is also a large zashiki tatami room. This room is the only place where smoking is permitted, so although Kissui cannot guarantee that you will never get a whiff of smoke in the rest of the restaurant (which is strictly non-smoking), I can testify to the fact that it is unlikely. Staff at Kissui have been taking English lessons to help them provide better service for their non-Japanese speaking customers – an explanation of the ingredients used in and preparation of each dish by the server to enhance the diner’s appreciation is an important part of the kaiseki experience. This should also help them deal effectively with special dietary requirements. Chef Morii is happy to prepare meat-free courses, though they do say that they are unable to prepare completely vegetarian courses, Kissui is a good option for the pescetarian. In addition to kaiseki courses Kissui also offers a la carte dishes such as sashimi and tempura. A range of drinks is also on offer which includes a selection of boutique sake (including some local varieties) that pair very well with the food. Thanks to GetHiroshima for this sensational recommendation, the baked yellow-tail with taro and almonds was sensational, the absolute star of the course. I generally don’t enjoy beef tongue but the chef created a mouth watering delight that simply melted on ones, ah, well, tongue! For 2 hours of stunning dishes being served by delightful staff for a mere ¥4,500 this is not to be missed. Be sure to mention that you are there for the special GetHiroshima course and you can’t go wrong. Dear GetHiroshima, Thanks very much for this recommendation! We truly enjoyed the magnificent dishes Kissui served up for lunch. We went with our 6 and 12 year old kids and booked a private function room as all other seats in the restaurant were already booked out for the next 2 days. They have set lunch menues for kids of different age groups and both us adults and the kids enjoyed every single bite. The presentation was beautiful and impeccable. In short, it was a very memorable lunch and the private room added greatly to the experience. We had the concierge of our hotel call for a reservation which helped quite a bit. Not to be missed!